The crust can be made in advance and the nicer you caramelize the onions the better the flavor is going to be so take care in that part of the process. The lamb can easily be cooked the day before then re - heated in the liquid it is cooked in. Take the carrots, garlic and onion and place in a pot or casserole style dish. 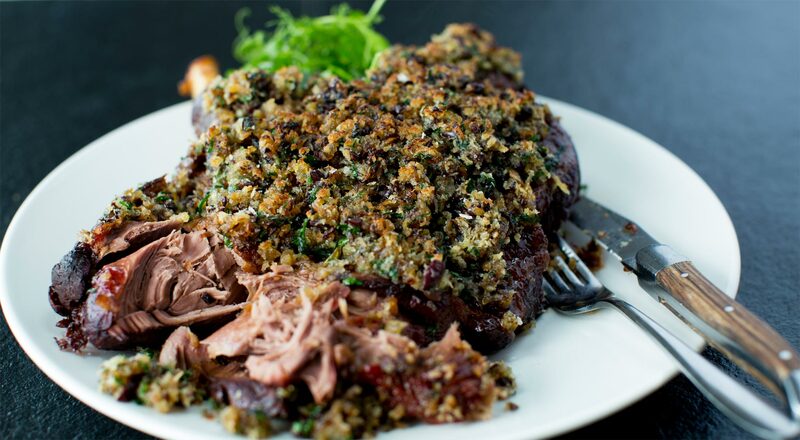 Rub the leg of lamb in sea salt and then place on top of the vegetables. Roast in the oven on 180’ for approximately 45 minutes until golden all over. Remove from the oven, add the red wine and chicken stock then cover with tin foil and bake in a 160’ oven for another 1 ½ hours until falling off the bone. Remove and rest for at least 30 minutes. Take the lamb out of the casserole and then strain the vegetables, discard and put the sauce back on to reduce by half until nice consistency and thickening. Make the crust by frying the brown onion in rice bran oil until golden and caramelized. Place in a bowl with the butter, parsley, bread crumbs, olives and season with salt and pepper. Lay across the top of the lamb and then grill until hot through and browned all over, serve the sauce on the side.